Here is the part two of my tribute to Jean "Moebius" Giraud, exceptional visionary comic book artist, who did a big part of the design of the original TRON movie and who passed away last saturday. If you've not read the part one posted yesterday i suggest that you read it HERE first. 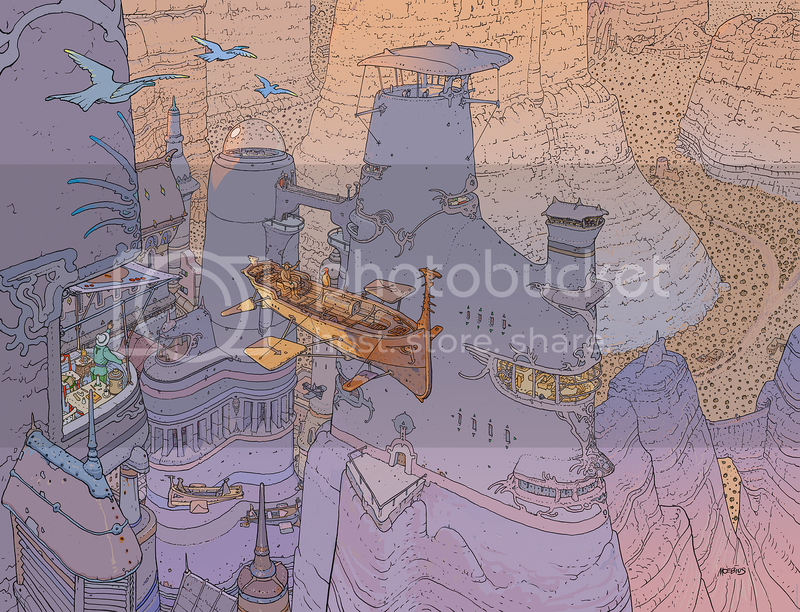 As promised, in this second part i'll show you some of his "Moebius" work and all artworks below are in high-res so don't forget to double click on each to see or get them in larger scale. 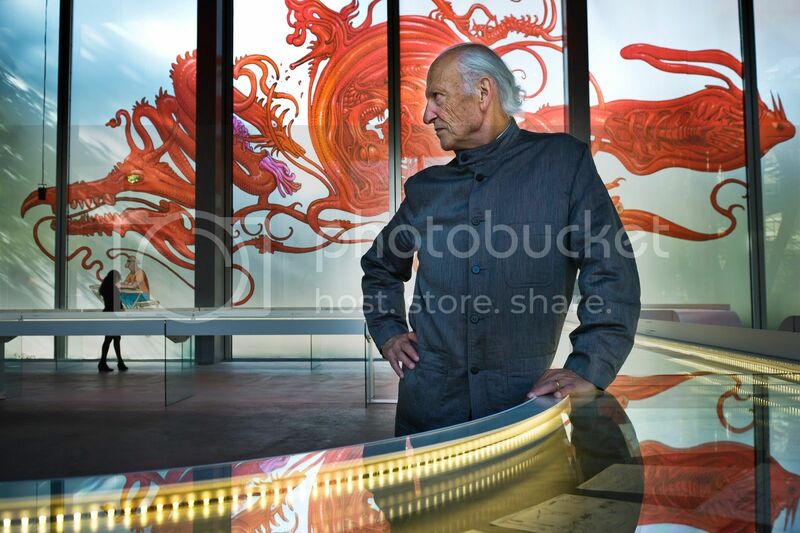 The picture of Jean Giraud at the top was shot two years ago at the Cartier Foundation in Paris when a huge exhibit opened, showing the best selection of his artworks from the early years until now. The exhibit lasted six months and was a huge success. Below, one of his most famous painting of the "Starwatcher" series. 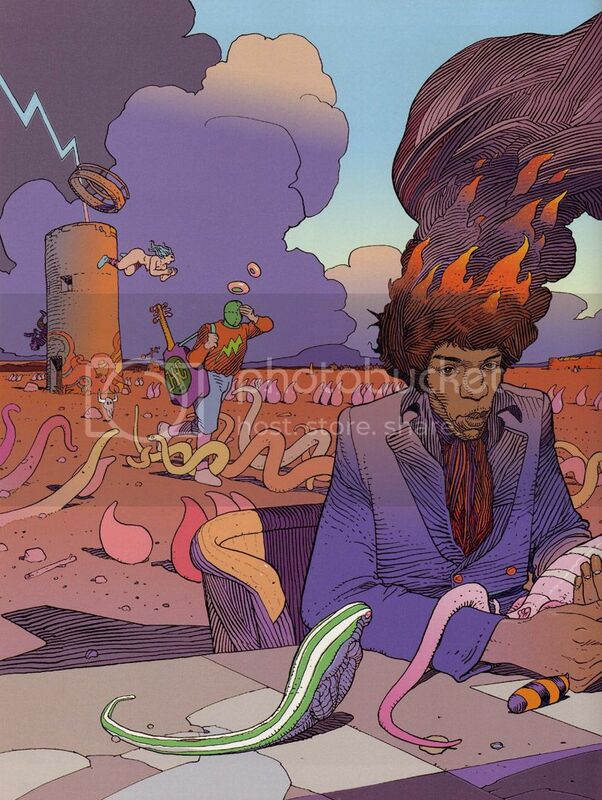 As anyone who was in his 20's during the 60's, Jean Giraud was influenced by the music of that time, and the two artworks below are in tribute to Jimi Hendrix. 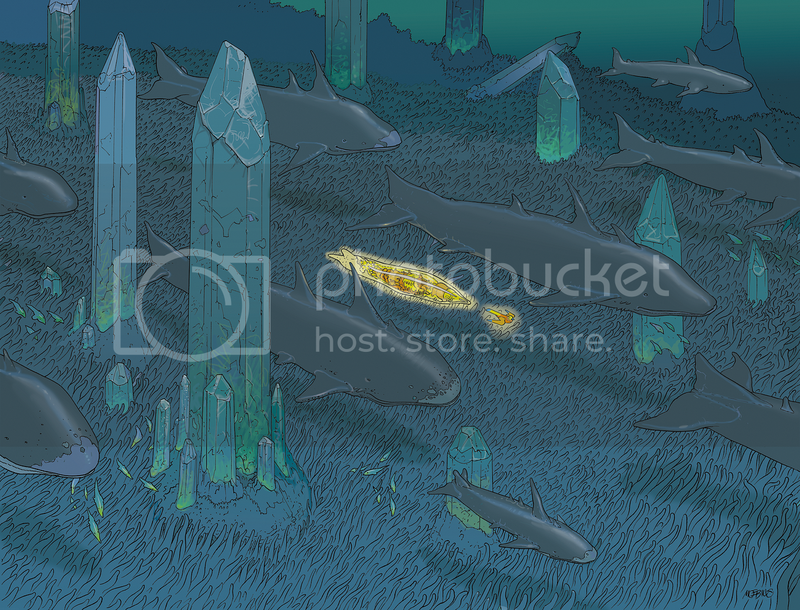 And now, here is the rare artwork that i promised to you yesterday. 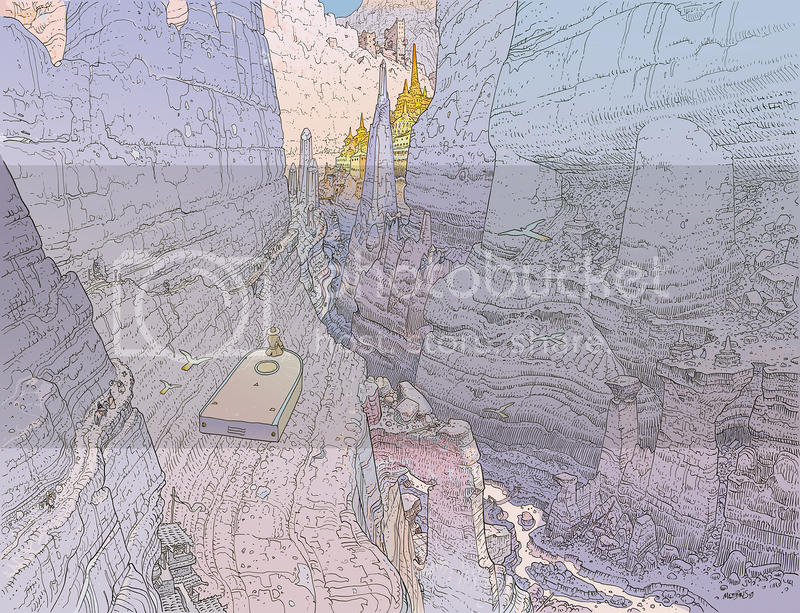 The nine artwork below were in fact done for the Hermès famous brand, who was releasing a new perfume and asked him if he could do some artwork on the theme of "Hermès Voyages" or "The Travels of Hermès" - who as you know was an Olympian god in the Greek mythology. 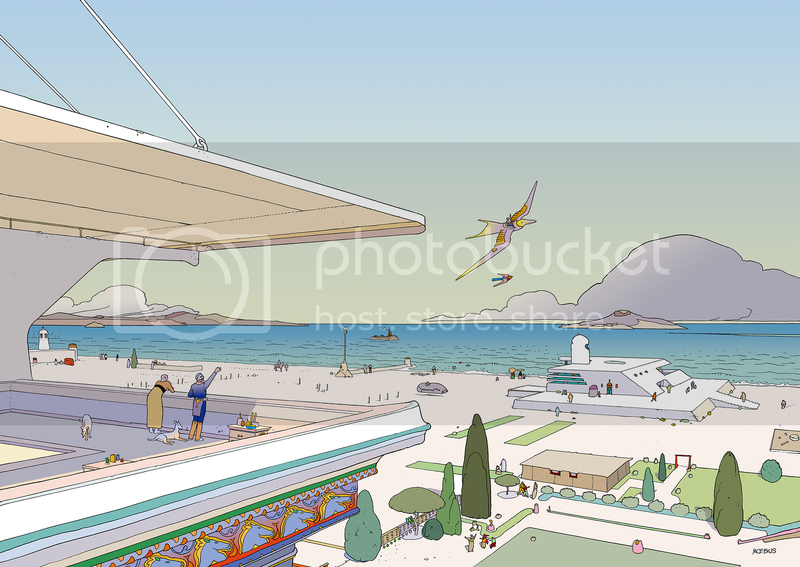 As usual, even working for a brand as famous as Hermès, Moebius did some "pure Moebius" illustrations, showing indeed someone traveling in different places but almost without any references to the brand products. 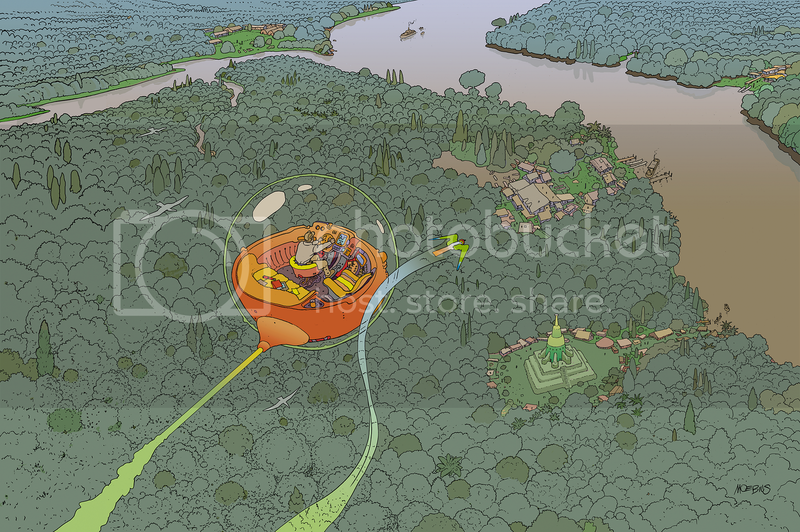 And as usual, it's stunning beauty, and i hope you'll enjoy these rare artworks. It's impossible to have a mind as visionary as he had and flying as such "altitude" - not to mention his amazing sense of beauty - without having a tremendous "fire" inside. 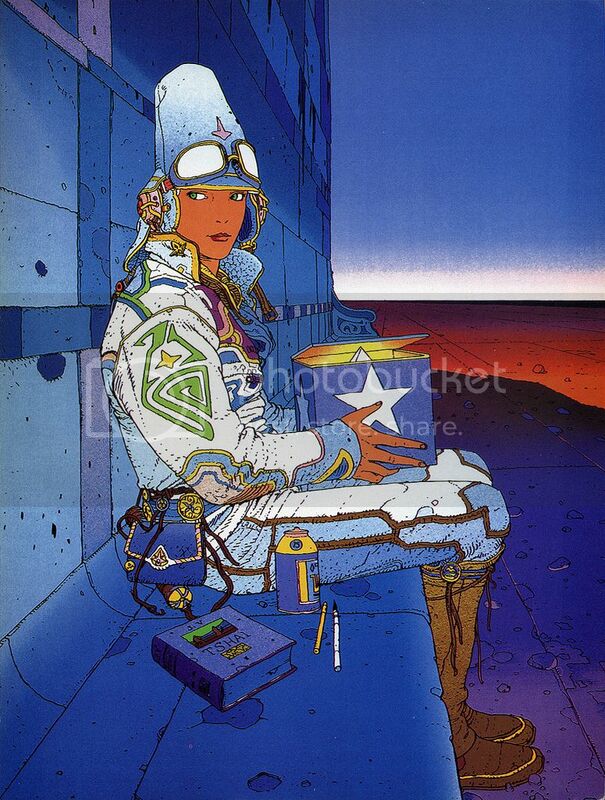 But if someone was asking me what was Moebius "secret", i think i would say that his genius partly came from his ability to keep his "fire" under control, and to redirect it in a creative way. Of course he had enough creative ambition and wanted to be the best, but his childhood which has been not really happy - parents divorced, raised by his grand parents, no sister or brother, etc... - might have been retrospectively a kind of luck. As any child he had to survive and he spent a lot of time drawing which later proved to be more important than anything. In two words, he found what he was born to do in his early years and that's one of the best luck that one can have - even if the price to pay for this was a not-so-happy childhood. 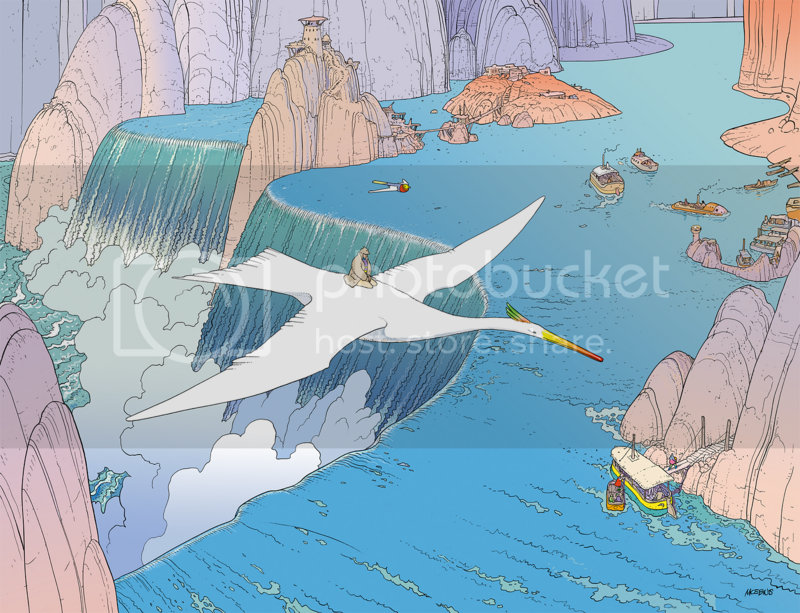 If you discover Moebius by reading these two articles and didn't knew him before, you're incredibly lucky! Why? Because you still have to discover his amazing work and it's just like discovering Venise ( Italy ) for the first time, i envy you, really . You'll find easily some of his books on Amazon and you can choose anyone you want as everything is good! Those who loved his work are generally more-than-super-fans and will miss him forever, but his production has been so phenomenal that i'm sure there is still plenty of dazzling books to discover, that we don't know yet. Whatever parallel universe you are in now, Jean, i wish you a wonderful journey! Nice series, Alain! 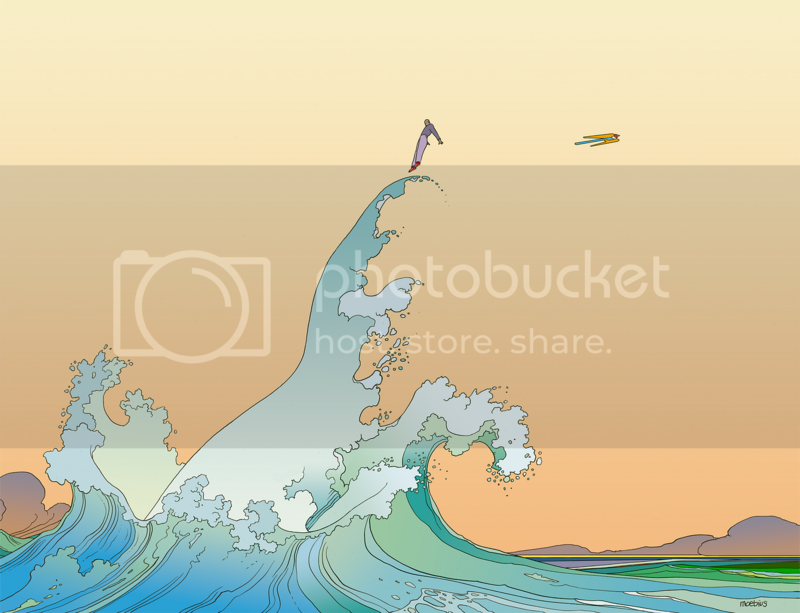 Much of his work reminds me of Peter Max. 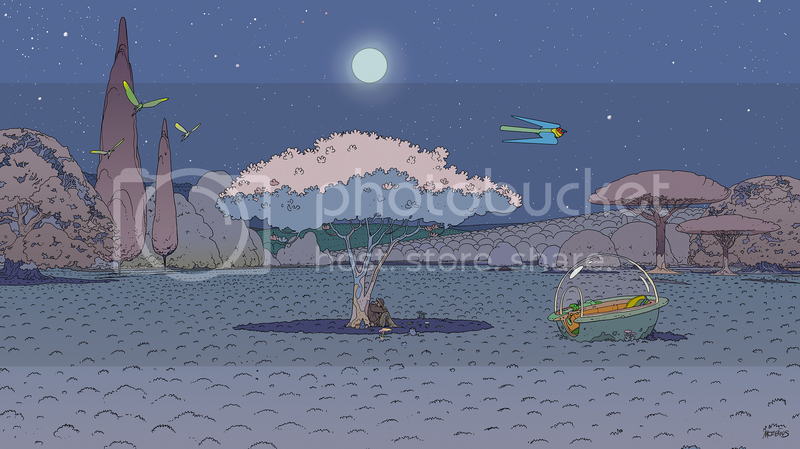 Thank you so much for posting this wonderfull pieces from moebius in hi.res.! I've got many comic books, but unfortunatly not one single poster. but now I can use some of his greatest pictures - I couldn't found elsewhere - randomly as screensaver. 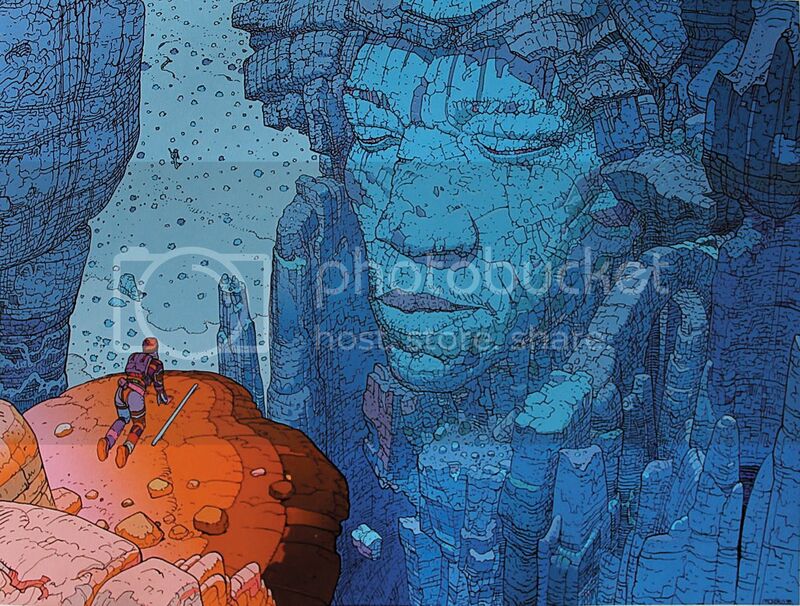 To call Moebius reminiscent of Peter Max is an insult to his incredible depth of technique and mastery of form. LAST CALL FOR DISNEYLAND PARIS BOOK PRE-ORDERS !